Mark Watney is stranded on Mars. He’s got a limited amount of food, a limited amount of water and a limited amount of air. He is very likely going to die. I loved The Martian! It’s a story of survival but never stops the characters from being incredibly realistic. For instance, when something goes wrong (like its wont to do when you’re on Mars) it’s perfectly natural to spend some time panicking or ranting and raving before pulling yourself together to figure out what you’re going to do next. Watney is a great narrator and likeable character. His sarcasm in the fate of certain death is funny and he’s obviously smart – he’s an astronaut so he’s got to be – but he often has to figure things out you’d never normally have to do in space. The Martian is full of scientific jargon and facts and figures as Watney works out how to survive. I have no head for science and especially not the sort of stuff astronauts know but it was very accessible as Watney often was working through the problems himself so it explained it all relatively simply to the reader. I picked up The Martian because I heard there was going to be a film adaptation and I loved the cast – seriously everyone in this film is great. 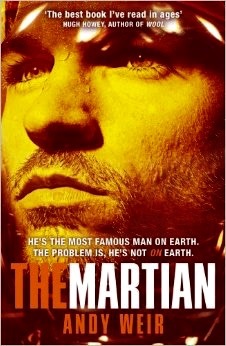 I’m so glad I read The Martian as while I’m hearing good things about the film, the book is going to be tough to beat. The Martian is funny yet tense and gripping. All the characters are great, especially the people of NASA who are trying to help Watney survive but at the same time there’s very little that they can do. I personally loved Annie NASA’s PR woman – as someone who’s now working in PR I can understand her pain when it comes to both the press and the people she’s working for. At its heart The Martian is a story of survival and how the whole world can come together to try and help one guy because stories of hope and success are what help people feel good about itself. I can’t recommend The Martian enough and it’s definitely one of my favourite books this year so far. 5/5.